Backstreet Soul, electrifying pop soul & funk played by professional musicians with real pedigrees, available for festivals, weddings, corporate events, parties. Backstreet have an unusually distinguished pedigree for a function band, and describe themselves as an organic band – not content just to play old standards and rest on their laurels, but continually working new material into their soul-based act, which consequently remains fresh and vibrant. Backstreet Soul are a phenomenal 6 piece band performing over 2 hours of electrifying pop soul and funk. Their dynamic stage show includes party classics from the 70’s to the present day performed by some of the UK’s finest musicians. 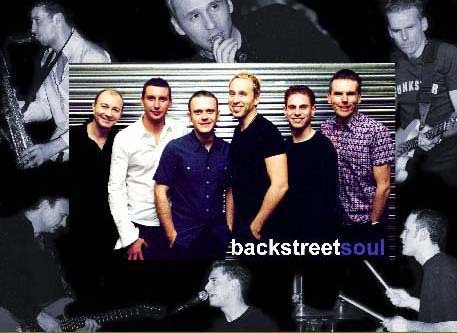 Formed in 1998 backstreetsoul have fast become one of the UK’s most exciting live bands and have already performed worldwide for many high profile companies including: Disneyland Paris, Sainsbury’s, Visa, Deutsche Bank, Arsenal FC, BP and The British Olympic Committee. The band carries a compact and powerful PA system as well as stage lighting and is available for all types of events including corporate entertainment weddings and private parties. Backstreet Soul are fronted by either Ian Harrison, Graham Dee or Nick Clow, depending on their availability. Ian Harrison (vocals) Ian has been a performer for most of his life. Starting at the age of 7 at the Corona Stage School, leading onto a varied and successful career both as a backing singer and lead vocalist. He has sung alongside (and behind) Nik Kershaw, Seal, Daryl Hall, Lulu, Jimmy Nail and Manfred Manns Earth Band as well as the infamous Spinal Tap. Graham Dee (vocals) When you hear Graham sing it is impossible to ignore his astonishing vocal talents, always treating the audience to a flurry of jazz licks, funked up soul lines and ragga rhythms. He has been a professional vocalist for many years in a wide range of situations. Nick Clow (vocals) Nick is one of the most sought after vocalists in the country. He has established himself as a fresh and exciting performer working with artists such as Boyzone, All Saints, Robbie Williams, Artful Dodger and Full Intention with whom he has had three top 40 hits in the UK, and a Number 1 both in Canada and the US. Andy Carr (bass) has been playing music professionally for over fifteen years, lending his considerable skills to Bruce Dickinson’s Top 10 Tattooed Millionaire album, which sold over half a million copies world-wide. As well as vast experience as a session musician, Andy has played with Shakespear’s Sister, Tony Hadley, Toby Bourke (including the duet single with George Michael), soul legends William Bell and Willie Tee and the multi-million album selling French band Niagara. Paul Harvey (guitar and backing vocals) was a member of 80’s chart bands Then Jerico and Ellis Beggs & Howard, not only performing but also co-writing a lot of their material. He has also worked with Prefab Sprout, Kool And The Gang, Thomas Dolby, Cliff Richard and Boy George. Paul has written hit songs with Tom Robinson, and is in fact as renowned for his song writing as he is for his funky, ‘in the pocket’ guitar-playing. Rob Hughes (saxophone and backing vocals) has been a professional musician since the age of seventeen. He has recorded The Paul Jones Blues Show on Radio 2, played with the rock group Magnum and recently recorded for the new All Saints album as well as a list of prestigious live appearances including Ronnie Scotts in Birmingham, Cork Jazz Festival and a tour of Holland. Rob also toured the UK for six months as saxophonist with the ‘Official Tribute To The Blues Brothers’ Musical. John Miller (drums). In September 2000, John was on a month long international tour with St. Etienne. He has played at many festivals, including Glastonbury and V2000 as well as touring extensively throughout America, Australia, Japan and Europe. He has appeared on Chris Evans’ TFI Friday, and This Morning with Richard & Judy (a particularly proud moment!!). His drumming talents can be heard on the latest albums by Toby Bourke, St. Etienne and Then Jerico. Jason Silver (keyboards and backing vocals). Jason is the youngest in the band, but is still an experienced musician, having toured in Europe and the USA and performed with Taka Boom (sister of Chaka Khan). As well as extensive live performance, Jason is a busy session musician and has played on many recordings including the top 10 single Why by Mis-teeq in January 2001.